…whereas the characters in classical cinema provided the central focus and occasions for dramatic interest in a story-world that unfolds according to its own internally defined logics, and whereas the camera served alternately to disclose this world in the manner of a transparent window or, more exceptionally, to announce its own presence as an (uncanny or self-reflexive) object of perception, the radically indeterminate cameras of post-cinematic filmmaking serve … to displace the characters, to take them out of the center of perceptual attention and instead situate them marginally with respect to a total environment of inhuman image production, processing, and circulation – and to situate us as viewers accordingly. The post-cinematic camera, in short, modulates the affective character of the wider world; it does not bracket that world out or substitute one of its own making – for it remains indeterminately contiguous to every level of the contemporary real, including the physical, the imaginary, and the virtual. 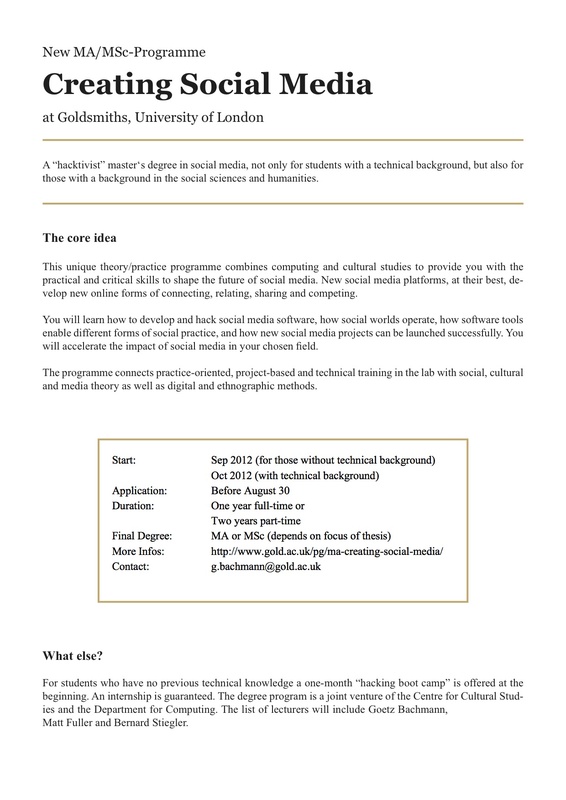 The following info about the Master’s program in “Creating Social Media” reached me recently, and I thought it might be of interest to readers. Note that the deadline for applying is quickly approaching! What does social media look like in the future? What will you create? At Goldsmiths, University of London, we offer an MA/MSc in Creating Social Media that provides students with practical and critical skills to shape the future of social media. The MA/MSc is a collaborative theory/practice programme across the Centre for Cultural Studies and the Department of Computing. Based on global examples, we explore the technological and intellectual questions that have risen to prominence with the social web. We critique existing approaches and tools, and plan, develop, hack and implement new applications and campaigns. We not only analyse: we create. – Computing skills in software development for new social media platforms, mashups, apps, and tools. – Theories of social processes and methods to research them. 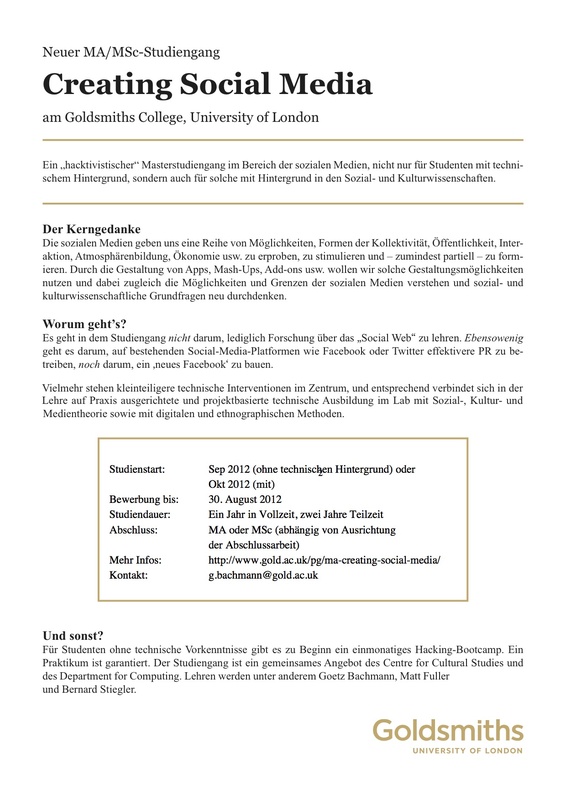 – Adapting social media to a variety of technological contexts and to the needs of specific communities. – Creating social media interventions that address social processes in new ways. – Surfacing the assumptions and limitations embedded in software. – Critically assessing contemporary discourses about social media and change. – Building software tools that enable different forms of social practice, and launching them successfully. The course draws together students from all around the globe, and from a wide spectrum, some with a technical background, and others whose main focus has been communications, culture, society or politics. We accept applicants until August 31 – but best apply as soon as possible.